Herbs, annual or perennial, stout, to 70 cm; rhizomes present. Leaves emersed or submersed; submersed leaves mostly absent; petiole terete to triangular, 2--36 cm; blade with translucent markings present as distinct lines, elliptic, lanceolate, or ovate, 2.6--15.5 ´ 0.5--20 cm, base truncate or occasionally cordate to tapering. Inflorescences racemes, rarely panicles, of 1--9 whorls, each 1--3(--4)-flowered, erect, 1.5--40 ´ 1.7--50 cm, not proliferating; peduncles 3--5-ridged, 2.1--57 cm; rachis triangular; bracts distinct, lanceolate, 0.3--2.5 cm, coarse, margins scarious; pedicels spreading to ascending, 0.6--2.8 cm. Flowers 6--11 mm wide; sepals spreading to recurved, 9--13-veined, veins not papillate; petals clawed; stamens 9--15; anthers versatile; pistils 45--200. Fruits oblanceolate, plump, 3--5-ribbed, abaxially 2-keeled, 0.9--3.2 ´ 0.6--2.5 mm; glands 1--2; beak terminal, 0.6--1.3 mm. 2n = 22. Flowering mid summer--fall. Clay soils of wet ditches, streams, and shallow ponds; 0--800 m; Ark., Calif., Fla., Ill., Iowa, Kans., La., Mo., Nebr., Nev., Ohio, Okla., S.Dak., Tex, Utah, Wis.; Mexico; West Indies; South America. Echinodorus berteroi is an extremely easy species to recognize when in fruit. The elongated beaks of the fruits project upward, giving the fruiting head an echinate appearance. The generic name, in fact, came from the fruiting head of this species. 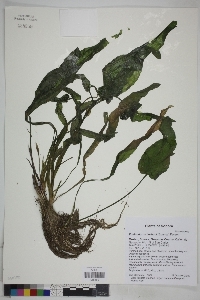 Annual or perennial aquatic herb to 0.7 m tall Leaves: emersed (rarely submersed) and erect, with a long circular or triangular stalk. The blade is 2.6 - 20 cm long, 0.5 - 12 cm wide, elliptic to egg-shaped or lance-shaped with a squared or heart-shaped base, marked with transluscent lines. Inflorescence: singly stalked along a central axis (raceme), rarely with loosely branched stalks (panicle), 1.5 - 40 cm long, 1.7 - 50 cm wide, broadly cone-shaped, erect, with the main stalk three to five ridged and becoming triangular, bearing one to nine whorls of three to eight flowers. Flowers: 6 - 11 mm wide, having spreading or recurved sepals (4 - 5 mm long) with nine to thirteen veins, three white petals that are 5 - 10 mm long and clawed, and nine or more stamens. Fruit: spherical, spiny (echinate), brown, 3 - 7 mm across, with more than 40 achenes. Each achene is 0.9 - 3.5 mm long, inversely egg-shaped, three- to five-ribbed, and beaked at the tip. Bracts: 0.3 - 6 mm long, lance-shaped, coarse. Similar species: The similar Echinodorus tenellus is a small plant (to 25 cm tall) with lance-shaped to linear leaves, 1 - 3 mm petals, six or nine stamens, and ten to twenty achenes per seed head. Habitat and ecology: Wet ditches and edges of swamps. Etymology: Echinodorus comes from the Greek words echinus, meaning "rough husk," and doros, meaning "leather bottle," referring to the prickly fruit. 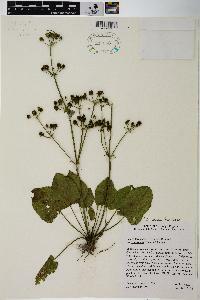 The only specimen of this species known to have been collected in Indiana is one in the herbarium of DePauw University. It was collected by Blatchley on the south side of Conover's Pond, now drained, which was located in the southeast corner of sec. 9, now within the city limits of Terre Haute, Vigo County. This species was reported from Tippecanoe County by Wilson, but his specimen can not be located. Erect annual, slender or often robust, 1-6 dm; lvs erect, long-petiolate, with ±ovate, basally ±cordate blade mostly 4-20 נ2-12 cm, or in small forms the blade smaller, more lanceolate, and tapering to the base, in submersed forms the blade very thin and crisped; pellucid lines of the lvs (visible in transmitted light) mostly less than 1 mm apart and often several mm long; scape simple or branched, with usually several or many whorls of 3-8 fls on stiffly ascending pedicels; bracts lanceolate or linear, 3-6 mm; sep ovate, acute, 4-5 mm, ±reflexed in fr, the veins smooth, scarcely raised; pet white, broadly ovate, 5-10 mm; stamens (9)12 or more; anthers 0.5-0.8 mm; versatile; achenes 40+, brown, 2.5-3.5 mm, the erect to oblique beak 0.5-1 mm, up to half as long as the body, the fruiting head 3-7 mm thick, echinate in profile; each side of the achene with 5 arching ribs, 2 of them wing-like and alternating with the others, the keel entire; each side of the nutlet with a lanceolate, acuminate gland toward the top, entering the base of the beak. In swamps and ditches; often on sandy soil; C. Amer. and W.I. to Calif., Tex., and n. in the Mississippi R. drainage to O., Ill., and S.D. June-Oct. (E. rostratus; E. cordifolius, misapplied) Our plants, as here described, are var. lanceolatus (Engelm.) Fassett.